The faster you can sort, process, and identify metals and alloys in your scrapyard or metals recycling center, the more profit you stand to make. Old x-ray guns are slow, and pose OSHA risks. Outdated XRF tools are easy to break and costly to repair. It's time for a new tool that gets it done without getting in your way. The ChemLite Plus is a breakthrough in handheld metals analysis. Designed for heavy use, it delivers fast precise readings of light metals and alloys you couldn't identify before. TSI's laser-induced breakdown spectroscopy, or LIBS analyzer technology is the most accurate available. Best of all, ChemLite is the only regulation-free handheld metal analyzer on the market. No regulation worries, no OSHA headaches, just fast, accurate sorting. + Three measurement speeds: 1, 2, or 3-second intervals. + Eye-safe, Class 1M laser product. + No argon necessary. + No XRF analyzer radiation risk; no dosimeter rings needed. + Laser cuts through grime and debris, minimizing sample cleaning and grinding. Streamlines your measurement process. + No x-rays, no more radiation safety paperwork, no protective goggles, no compliance checks, user training, user restrictions, or annual fees. + Rugged design with built-in cleaning mode. + High power laser for accurate measurement. + 5" color touchscreen display holds up to heavy use. + Detect Li and Be in Aluminum down to 1 PPM. + Ergonomic handle greatly reduces worker fatigue. + Largest spot size on the market, no rastering required. Analyze aluminum alloys with ease and speed. 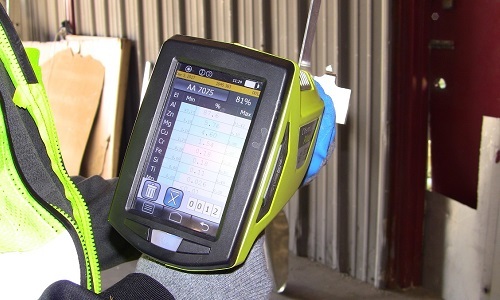 More metal recyclers and scrappers are choosing the lightweight, rechargeable ChemLite Plus laser analyzer every week. Your business needs an upgrade from your old XRF gun. The ChemLite Plus gets out of the way, so your team can do what it does best—sort metals and build your business . . . faster. Try it for yourself—schedule a demo today!